If you have a website or a blog, then I’m sure you’ve thought about monetizing it. Most website owners use AdSense and sign up for some affiliate programs, usually no more than two or three. Some companies make it easy to become their affiliate, while others have a number of restrictions and make it difficult for a simple blogger to join. But what if you could join any affiliate program by signing up to just one service? VigLink makes that possible. 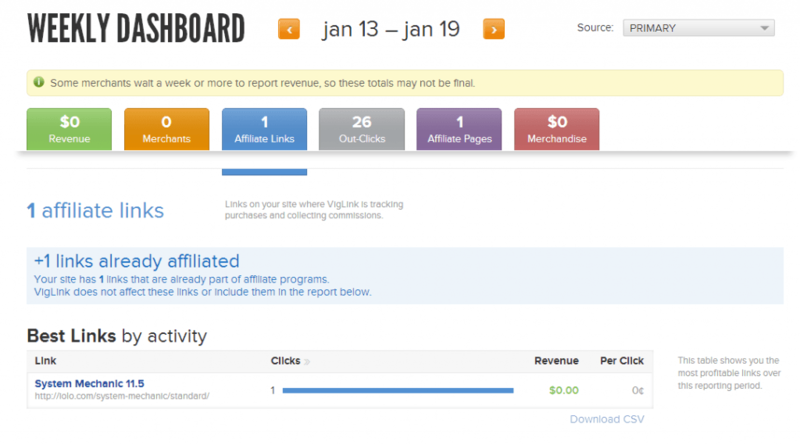 VigLink is an affiliate marketing system that could be a goldmine for a blogger or a website owner. Basically, VigLink does something that would take you ages to do – it joins various affiliate programs. Just to give you an idea, currenty VigLink works with 30,000 merchants and the number is growing. This means that if you get yourself a VigLink account, you can become an affiliate of all those companies as well. Sounds cool, doesn’t it? Of course they don’t do it for free – they take a 25% cut from your earnings, but that’s still a pretty good deal. In fact, you might be getting a better deal than if you sign up for an affiliate program by yourself because VigLink manages to negotiate better commission rates than individual bloggers. VigLink lets anyone sign up for free. You don’t even have to have your own domain – you can use WordPress subdomains, Blogger, and even Tumblr. You can also use VigLink with phpBB, TypePad and vBulletin which means that you can use it if you have a forum or a board. Installation is really easy and VigLink provides detailed instructions. Anyway, it’s as simple as pasting a bit of code into your site or installing a WordPress plugin. Once VigLink is installed, it will try to affiliate any single outbound link on your website. Remember the 30,000 merchants? Well, they even include Amazon and eBay. So the chances of your links being affiliated are a lot higher than VigLink not being a partner of the product or a service you are linking to. When it comes to link insertion, VigLink is customizable enough to not interfere with your content (anyone who has ever tried Infolinks knows how crappy in-text advertising can make your site look). With VigLink it’s up to you how you insert links. You can choose for the platform to simply affiliate the links you insert. If you are a member of any other affiliate program, I recommend going to Features on VigLink’s website and make sure you are not re-affiliating any links (your commission will be smaller if you do). If you don’t want to bother yourself with linking to anything and if you don’t mind having your site stuffed with outbound links, you can configure VigLink to insert links when it sees you mention one of their partners. This is a good idea and enabling link insertion can save you a lot of time and trouble. You can’t control the number and density of links from your account, but you can simply email VigLink support, tell them where and how many links you want and they’ll do everything for you. VigLink are careful about what and where they insert, so don’t worry about SEO – there will be no damage whatsoever (this is not me blabbing – I got this information confirmed by VigLink staff. And if you don’t believe me, you will believe Google – VigLink is backed up by Google Ventures). VigLink has a good reporting functionality, which you can access as soon as you log into your account. You are presented with a dashboard that lets you see your current and all time revenue, the number of clicks per month and all time, as well as a calendar that registers clicks. You can check your performance for any given day by clicking on it on the calendar. You will then be redirected to another page where you can see all sorts of data for a given week – affiliated clicks, revenue, non-affiliated links, and so on. One of the features I really liked is Merchant Explorer – a tool that allows you to check if a merchant is affiliated or not and lets you browse all partners. The cool bit if that you can see what sort of commission each merchant pays and whether its commission for a sale, a lead or a click. Merchant Explorer can be found under Tools and you don’t have to have an account to use it. So anyone can check VigLink’s partners and commission rates by going to www.viglink.com/explorer. VigLink pays via PayPal and there is no minimum payout. All that is needed from you is your PayPal email address, a filled in tax form (you can do it on the website – it’s easy), and a bit of patience because VigLink doesn’t pay you immediately – you have to wait. VigLink pays on a net-60 days basis. This means that you have to wait for two months to get paid.